A 16 amino acid peptide from near the amino terminus of human TIM 1. Our Abpromise guarantee covers the use of ab47635 in the following tested applications. WB Use a concentration of 1 - 2 µg/ml. Predicted molecular weight: 39 kDa. 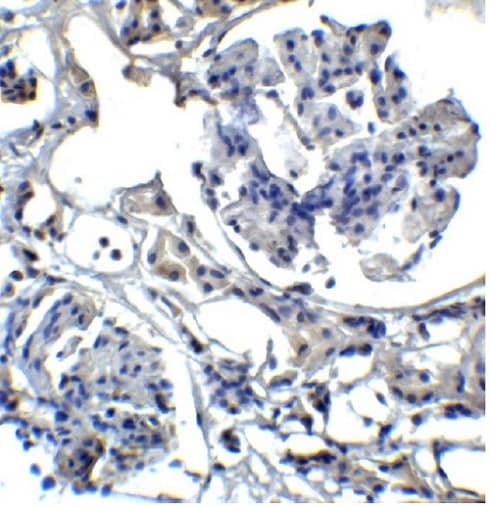 Ab47635 at 5μg/ml staining TIM1 in normal human kidney tissue section by Immunohistochemistry ( IHC-P-Formalin/PFA fixed paraffin-embedded sections). 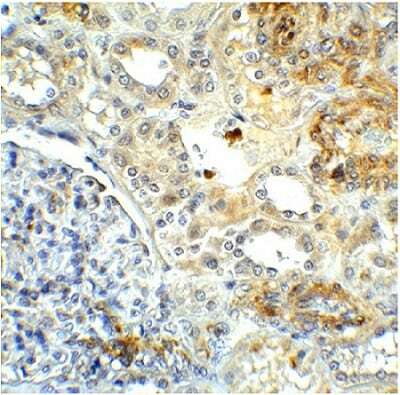 Ab47635 at 5μg/ml staining TIM1 in human kidney carcinoma tissue section by Immunohistochemistry (IHC-P-Formalin/PFA fixed paraffin-embedded sections). 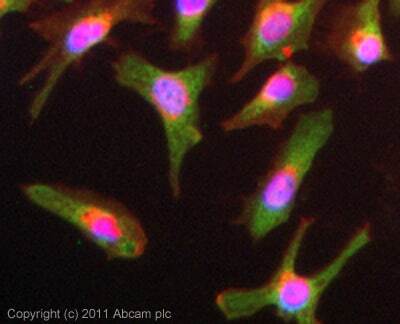 ICC/IF image of ab47635 stained HeLa cells. The cells were 4% formaldehyde (10 min) and then incubated in 1%BSA / 10% normal goat serum / 0.3M glycine in 0.1% PBS-Tween for 1h to permeabilise the cells and block non-specific protein-protein interactions. The cells were then incubated with the antibody (ab47635, 5µg/ml) overnight at +4°C. The secondary antibody (green) was for 1h. Alexa Fluor® 594 WGA was used to label plasma membranes (red) at a 1/200 dilution for 1h. DAPI was used to stain the cell nuclei (blue) at a concentration of 1.43µM. Publishing research using ab47635? Please let us know so that we can cite the reference in this datasheet. I wish to purchase a KIM-1 Ab in mouse, rat and human. With regards to all the KIM-1 products you sell, which detect the KIM-1 ectodomain (which is shed into the urine during renal injury) and which detect the remnant peptide as detailed in the attachment or do all the products only detect one of these? Product ab47635 was raised using N-terminal peptide and immunogen corresponds to the ecto domain of protein Tim 1 (http://www.uniprot.org/uniprot/Q96D42). This antibody has been tested with mouse and human samples in WB, ICC/IF and IHC-P. I ordered the anti-TIM1 antibody Ab47635 but I have been having no success with western blots. I am trying to detect KIM-1 (TIM-1) in lysate from whole kidneys. According to many published papers, KIM-1 increases in the kidney following injury. However, when I run my samples on a western blot 1) there is no difference between non-injured kidneys and kidneys from animals with a significant rise in serum creatinine and 2) in both samples I am getting upwards of 15 bands at all different sizes. I have tried blocking with both 5% Milk and 5% BSA with no difference in the results. I am currently working on confirming that KIM-1 mRNA is increased in the injured sample by qPCR. I am using a standard NP-40 based lysis buffer. Any suggestions? The image on our datasheet for this product ddoes show high non-specific background as well which seemed to be tamed but not eliminated by using a much lower dilution of the product. In that particular case 1ug/ml versus 2ug/ml with 15ug of total protein per well. Althought the exact concentrations will be different with each protocol and tissue type the principle should hold. I would recommend that you titer the ideal antibody concentration at a much lower level.